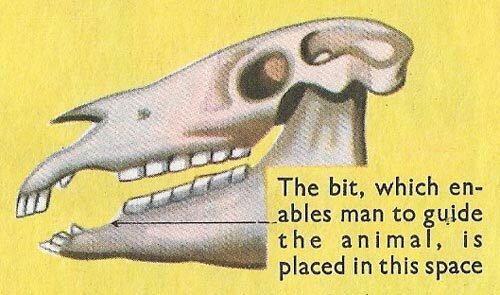 Skull and teeth of a horse. 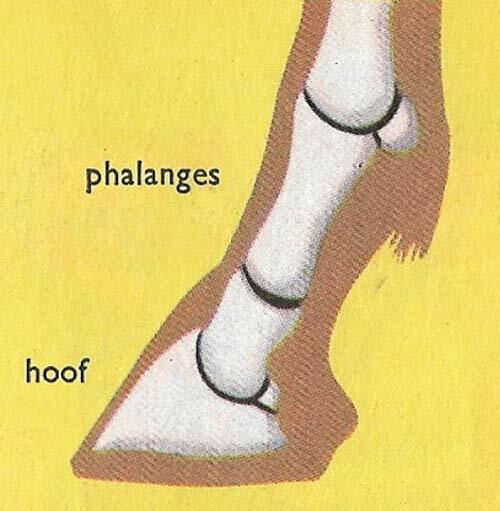 Members of the horse family walk with their weight on the single toe at the end of each leg. This is teh characteristic of animals belonging to the sub-order Perissodactyla – that is, animals having an odd number of toes. The horse's toe is strongly developed and is protected by a thick, hard nail called a hoof. The front hoofs are a little wider than the black ones. The hoofs are shod to protect them on roads. 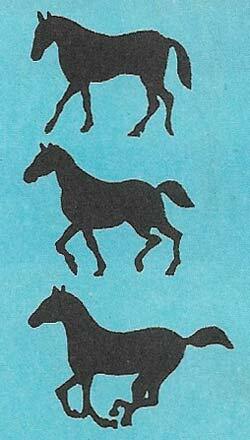 The members of the horse family are tall and agile. Their legs are slender and they are able to run at great speed. Tame horses may had had their origin in two kinds of wild horses – the Mongolian wild horse (or Przewalskis horse), and the Tarpan. The former still exists in Central Asia, where it was discovered by a Russian colonel whose name it bears. The latter formerly lived in Eastern Europe and in European Russia, but became extinct in the nineteenth century. It is not known exactly when horses were first domesticated, but it is certain that they have become more elegant in build and move faster since they have been bred by man. It was only in the tenth century that the practice began of protecting horses' hoofs with special iron shoes. This enabled horses to travel over stony and hard ground more comfortably . 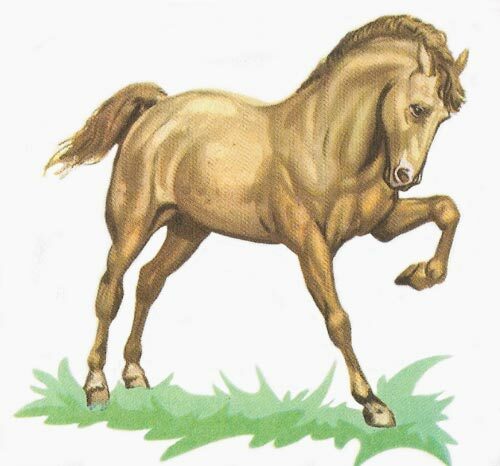 Today there are numerous breeds of horses which differ from each other in build. Ponies are horses which have remained small, and are descendants of the small Celtic horses. 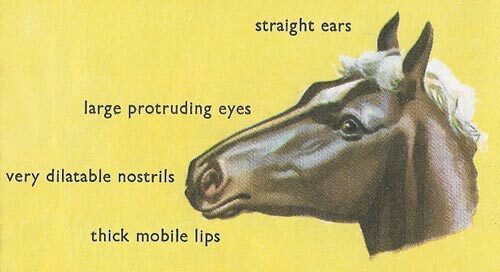 A normal horse lives for 30 to 40 years. The head is fairly long and the face is very much developed in comparison with the portion containing the brain, which is fairly small (see Figure 1). There are 40 teeth: 12 incisors, 12 premolars, 12 molars, and 4 canine teeth. The canine teeth are separated from the premolars and incisors by a stretch of gum with no teeth. The female has no canine teeth. 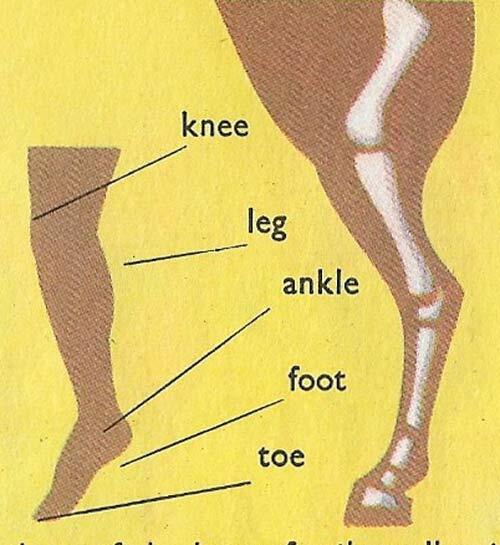 Members of the horse family walk with their weight on the single toe at the end of each leg. This is the characteristic of animals belonging to the sub-order Perissodactyla- that is, animals having an odd number of toes. The toe is strongly developed and is protected by a thick, hard nail called a hoof. The front hoofs are a little wider than the back ones. The hoofs are shod to protect them on roads. Height to withers: 46 to 70 inches (usually reckoned as 11 hands 2 inches to 17 hands 2 inches, a hand being 4 inches). Weight: hacks and hunters from half a ton; a shire stallion may weigh a ton or more. Coat of various colors with short, soft hair. Daily diet: the figures given are approximate and would vary with the size of horse, the work it does and so on. 8-14 pounds of hay a day, 9 pounds of oats, 4½ pounds of stray, 11 pounds of beans. The horse's gait. Walk: 90 yards a minute. Trot: 220 yards a minute. Gallup: up to 40 miles per hour. The donkey is an intelligent animal, gentle and very hard working. It is capable of carrying heavy loads even up mountains. The origin of the domestic donkey is mysterious; it seems that it originated in Africa. From here little by little it moved to all the hot climates of the world. The donkey can live for 25 years or even longer. It can eat very poor foods including dry herbs and leaves. It prefers clean water however and will not drink tainted water. The female of this animal produces a lot of milk, which is used as a medicine. 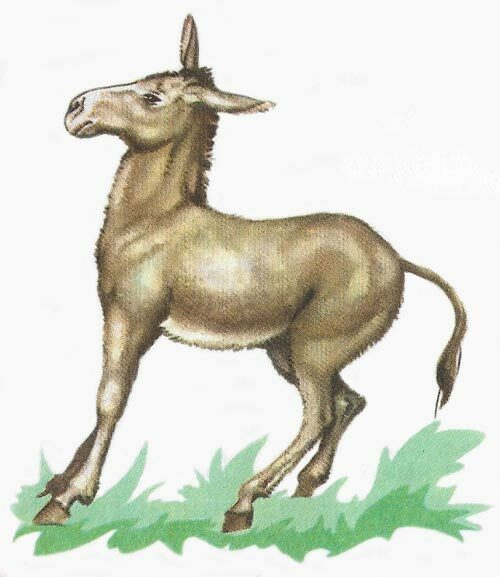 The donkey's coat is light and short during summer, and long and dull in winter. Height at shoulder: 31 to 62 inches. Coat of a uniform color with a dark stripe down the mid-line of the back, and usually, a dark shoulder stripe. 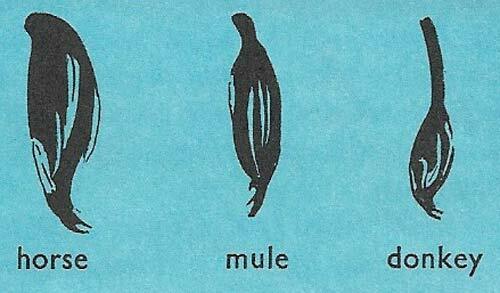 The mule, offspring of a male donkey and a mare, has many of both parents' characteristics. It can carry heavy loads like its mother, and is like its father in build and resistance to fatigue. It can keep its balance when walking among stones and rocks on the edge of precipices. It is, therefore, extremely useful in high mountain villages where there are no roads. Its only defect is its stubbornness; if it does not want to move, to harry a load or to do some work, it is very difficult to make it do so. 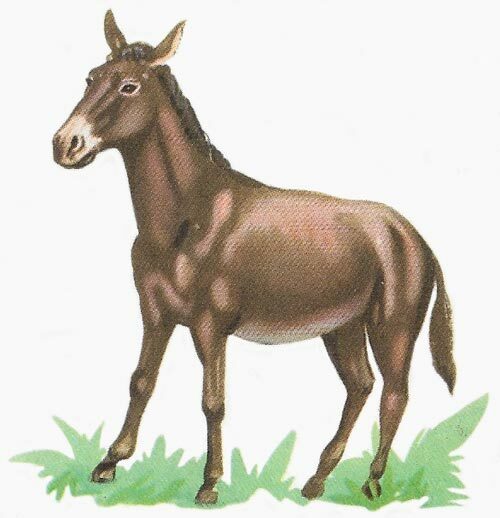 The hinny is the offspring of a horse and a female donkey. It is, like a mule, gentle and resistant to fatigue. However, it is not very common (since, being smaller than the mule, it is not so strong and can do less work). Height to shoulder: 39 to 62 inches. The zebra is a kind of wild horse living on the savannahs of East and South Africa. They live in herds, often in company with animals such as antelopes and gazelles. The herds graze the grassy plains where there are few trees. They are thus able to see danger when it is still far off. 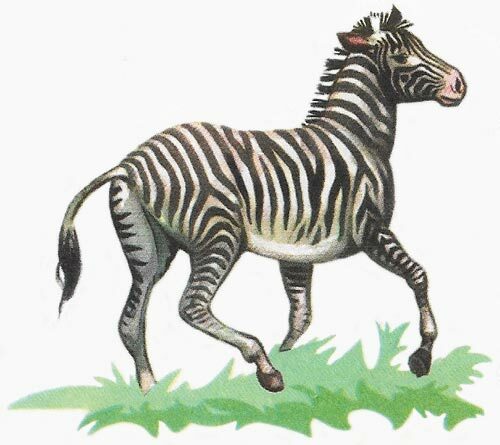 Zebras have very sharp sight and an acute sense of smell, and are soon aware of the approach of the enemy. Other grass-eating animals join them and have such confidence in them that they copy all their movements. If the zebras are quietly grazing, they also graze, but if the zebras run, they follow immediately. Height to shoulder: 49 to 62 inches. Light coat with black stripes. The first ancestors of the members of the horse family were called 'eohippus'. They lived about 60 million years ago, in America, and were barely 25 centimeters (10 inches) high. In the thousands of years that passed they grew taller, sturdier and faster. Man migrated from America into Asia, the two continents then being joined by a land-bridge across the Bering Strait. There favorable conditions for horses were found and they rapidly increased. Their shape altered further until they looked as we know them. In the meantime, they had disappeared completely from their place of origin, America. A long time later, in the sixteenth century, they were taken back to America by the Spanish conquerors.